M Design Boutique creates private event labels all the time, and so what could be a more natural extension of these custom design offerings than to offer private label products for stores, events and other promotions? Actually, MDB started offering these services awhile ago to local businesses, and it is exciting to be able to bring it to all customers. 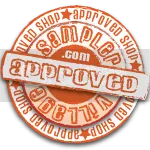 The items purchased will be private labeled (design is included in cost of each minimum order) with product name, logo description, and any other agreed upon elements. Signature fragrance design is included in your service based on your location, customer preferences or any other consideration required. 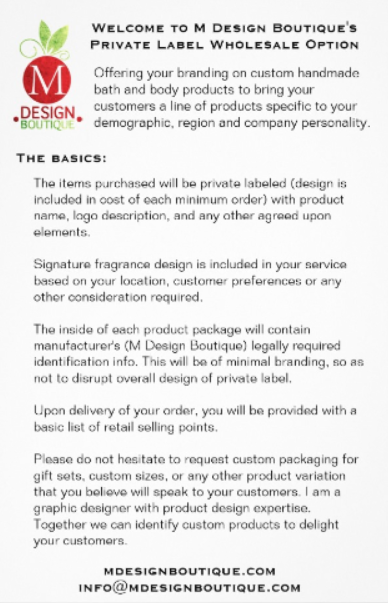 The inside of each product package will contain manufacturer’s (M Design Boutique) legally required identification info. This will be of minimal branding, so as not to disrupt overall design of private label. Upon delivery of your order, you will be provided with a basic list of retail selling points. Please do not hesitate to request custom packaging for gift sets, custom sizes, or any other product variation that you believe will speak to your customers. I am a graphic designer with product design expertise. Together we can identify custom products to delight your customers. The most common private label product by M Design Boutique is the two ounce travel candle, contained in a tin with private label on the top/lid. Tins are brushed silver with beveled lid. Wax is 100% long-burning premium soy, creamy white in color. Wicks are 100% cotton for clean-burning. Per product minimum = 20 pieces per fragrance and/or label design. Suggested retail price of single candle is $5-$8 depending on your price points, location, customer base, profit requirement per piece. You may determine your retail price within the suggested range based on your customer. Contact Melissa Machowski at info@mdesignboutique.com to place your custom private label order, or to discuss your needs in more detail.